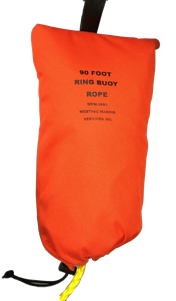 Our bag contains 90' of 3/8" floating rope in an orange 600 denier orange pouch. It attaches to the life ring for easy storage and quick deployment. 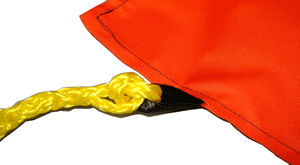 The rope is 3/8" yellow hollow braid polypropylene (floating) with a 1980 pound breaking strength and the polyester pouch keeps the bulk of the rope protected from ultra violet degradation. Use of this bag will allow the rope to deploy freely when the life ring is thrown, saving time and frustration. As shown in the picture below, the rope comes spliced to the polyester webbing loop which extends through the bag. In addition to use on board vessels, these bags are popular with shore based installations. USCG and SOLAS require that the line be not less than 3/8" in diameter and have a minimum breaking strength of 1350 pounds. The line may not be tied off to the vessel. Commercial fishing vessels 65' and larger must have at least one life ring equipped with a 90' line. Commercial fishing vessels under 65' must have one life ring equipped with a 60' line. 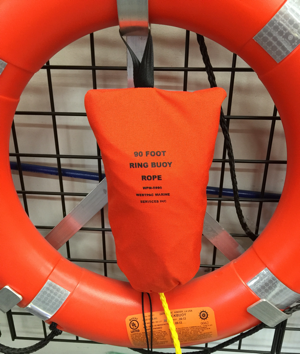 OSHA requires "ring buoys with at least 90 feet of line shall be provided and readily available for emergency rescue operations". Bulk shipping: We can ship 25 bags in a 30" x 20" x 12" fiberboard box and the total weight is 52 pounds.